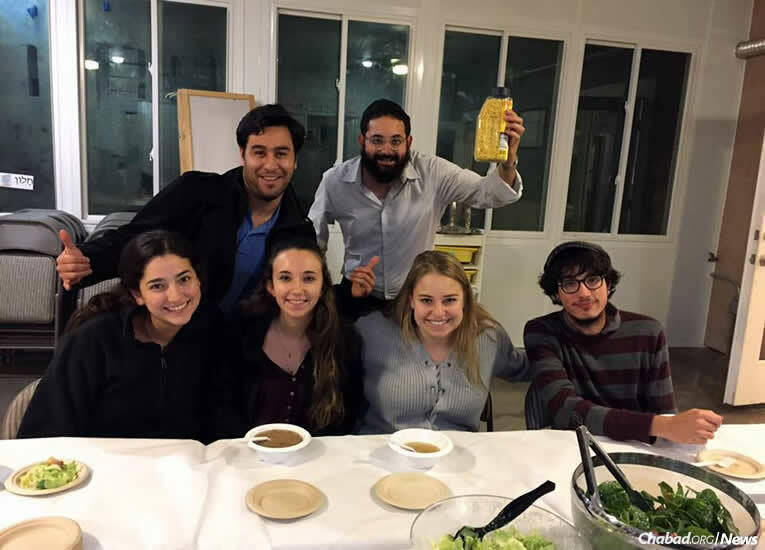 Rabbi Chaim and Miki Hilel, co-directors of Chabad of SLO & Cal Poly-Rohr Center for Jewish Life, have become known on campus not just for Jewish programs and study, but for their their free “Chicken Soup Express” service. Here, the rabbi, Israeli soup nuts in hand, stands next to Matt Malsin. Seated, from left, are Brittany Friedman, Aliza Herzberg, Meghan Gross and Dean Sprague. Alex Lustig, a freshman at California Polytechnic State Institute, had come down with mononucleosis, which left him utterly wiped out. He was in need of rest, care and a little homemade food. Once she heard the news, his mother, who lives 16 hours away in Seattle, did what any Jewish mother would: She called in an order of hot chicken soup for her son. But she didn’t call a takeout place. She called the local Chabad rabbi, who took the order, packaged it up and delivered it to Alex the very same day. 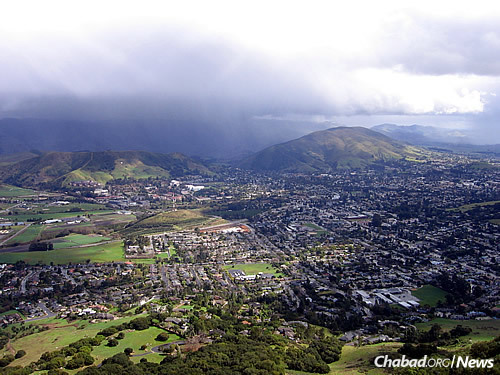 Hilel and his wife, Miki, have served as Chabad-Lubavitch emissaries for both the university and the general Jewish community of San Luis Obispo—a coastal town almost exactly between Los Angeles and San Francisco—since 2009. The parents of three young children, he is originally from Montreal; she is from Brooklyn, N.Y. They run all kinds of Jewish programs, classes and Torah-study sessions, but what has also made them known in university circles is their “Chicken Soup Express,” giving out free, homemade kosher chicken soup to students in need and to members of the general community whose kids are sick. 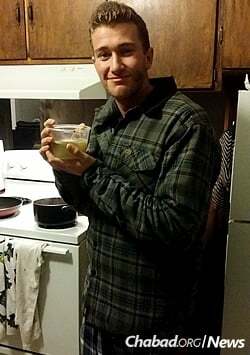 Third-year student Jeffrey Albaum, who was under the weather on Sunday, got soup delivered to his house by the rabbi. On any given week, they prepare and deliver about 25 bowls of hot soup. It’s become so popular that when they are out of town, they arrange for a student to deliver it in their stead. At first, to publicize the soup service, the rabbi made a magnet for parents to stick on their fridge and help spread the word. But then, social media entered the picture. On a Facebook page for the parents of freshmen at Cal Poly, moms and dads started sharing how many times the Hilels had brought chicken soup to students who weren’t feeling well, Jewish and non-Jewish alike. Soon, the Chabad couple started getting referrals—a parent, sibling or friend would let them know who needed a little pick-me-up, sending names, addresses and cell-phone numbers. Of course, it wasn’t just about the soup. They noted how impressed and moved they were—and still are—by the care and concern the couple has shown for their children. “He delivered soup to my daughter also last week when she had strep, a 102 fever and the flu. She loved the soup and the amazing generosity. What a great human being!” wrote Katie Prescott. Some 20,000 students attend Cal Poly. About 800 to 1,000 of them are Jewish, according to the rabbi, who keeps an email list with 300 or so names of people he knows. He says they’ve gotten hundreds of comments about the soup deliveries through social media—and they keep rolling in. It has also brought some Jews into the fold, though the Hilels note that on average, they give out more soup to non-Jewish students. One local business owner they’d been reaching out to for years saw a post about the soup deliveries and ended up sponsoring an event. A few Jewish students they hadn’t interacted with previously started coming after they received soup, one regularly. Parents donated during a recent matching campaign fundraiser because of all the positive comments on social media. 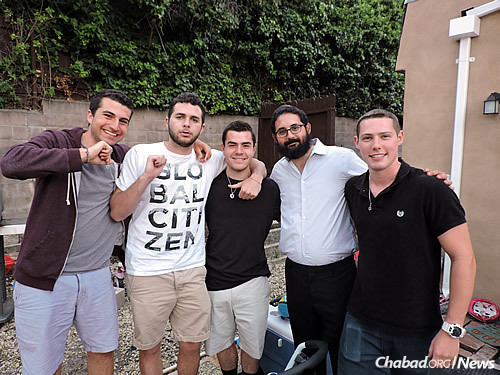 On a typical Shabbat, more than 100 students come to the Chabad House (double that for Rosh Hashanah dinner). They expect to host 250 people for Passover. And they sponsor other food-related programs that appeal to college students: challah-baking in the Hilel kitchen, and “Cookies and Conversation” every Tuesday with Miki Hilel. Instead, they get something when they need it most. That’s a big draw for young adults; it’s genuine—and as for the soup itself, it’s a little reminder of home. Chabad on Campus, insists Hilel, is “supposed to be a home away from home.” It’s a place where students can find social events, educational programs, Torah classes, kosher food and Jewish holiday celebrations. It’s a place where they can come to and talk about college life and some of the challenges that go with it. And in this city (population nearly 50,000), one of California’s oldest communities, it’s also a place where they can find comfort in the form of hot chicken soup. 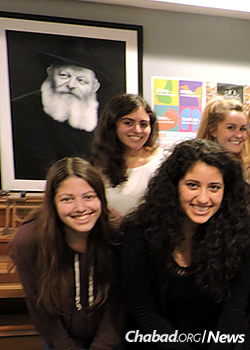 Jewish Federation to North Carolina Chabad: Keep Up the Great Work! One of the Loveliest Couples on the West Coast The Hilel family is a lot of energetic, good-spirited and giving people, who's hospitality and openhandedness I've witnessed firsthand. The second I saw the headline "A Little Hot Soup for California Students...", I knew exactly who it was referring to.